The Sargent Collection brings timeless style to any space. Strong and shapely, the collection includes an armchair, footstool, 2 seater and 3 seater sofa. 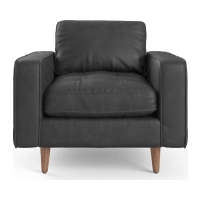 Upholstered in our premium Top Grain leather, which is thick yet soft. It comes in two classic colours of warm Tan and smokey Ash. The beauty of leather is that it develops character and softness with age. So this set is guaranteed to be around for the long haul. We’ve made sure that the Sargent set looks as good as it feels. With a feather filling, spacious seat and wide armrests. The sofas also feature extra cushioning on the sides, so you can really get cosy.